Foreign Secretary Boris Johnson spoke about the relationship between Latvia and the UK from a centenary perspective. Boris Johnson noted in particular that the tree has arrived in London from Valka district, where the foundation for an independent Latvian state was laid one hundred years ago. Foreign Secretary confirmed that the friendly relations between Latvia and the UK will remain unchanged also after the United Kingdom withdraws from the EU: although leaving the EU, the UK remains in Europe. The Ambassador of Latvia, Baiba Braže, highlighted the close historical ties between both countries, recalling that the UK recognised the Latvian Provisional National Council as early as on 11 November 1918. The Ambassador pointed to the well-developed cooperation today, one of the areas being business cooperation, especially the export of Latvian timber products to Britain. Ambassador Braže also mentioned that the first Christmas tree ever decorated was the one in Riga in 1510. The Embassy of Latvia in the United Kingdom arranged the gift of a Christmas tree with support from a company, “Norvik Timber Industries”. 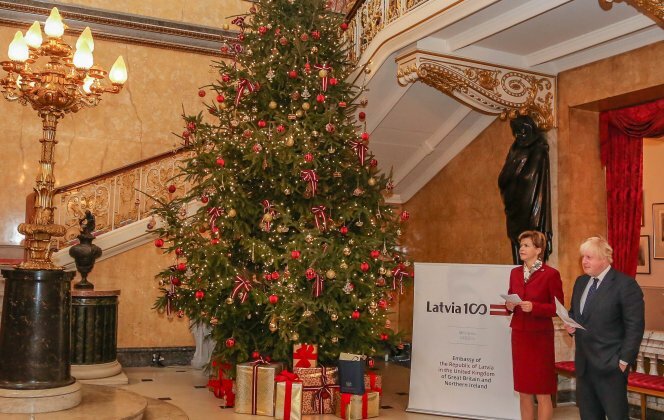 The six-meter tree from a tree nursery in Valka district, “Romfords Ezernieki”, was transported to Britain and put up in Lancaster House with the help of the diplomats and staff of the Latvian Embassy as a reminder of the friendly ties between Latvia and the UK.